Analog is now and wants to be seen. The Call for Artists starts now. The inimitable magic of photography will not fade. Historical, analog, and alternative forms of photography – and the often associated work in the darkroom – do not decline despite the triumph of digital photography and digital image processing. Quite the contrary: analog photography and its photographic processes are experiencing new heights and constantly get new enthusiastic supporters, especially among younger generations. Increasingly, photo artists turn towards the fascinating analog image processes again, thus not letting them fall into oblivion. As part of the Worldwide Pinhole Day in April 2015, EXPOSED shows a broad artistic spectrum of these creative forms of photography. The exhibition displays not only photographic works done by classic analog techniques, but it also shows photography from its decelerated side using pinhole camera, wet plate, infrared, and much more. The resulting images transform the magic of materials and processes into an artistic expression of the present – attracting attention once again. 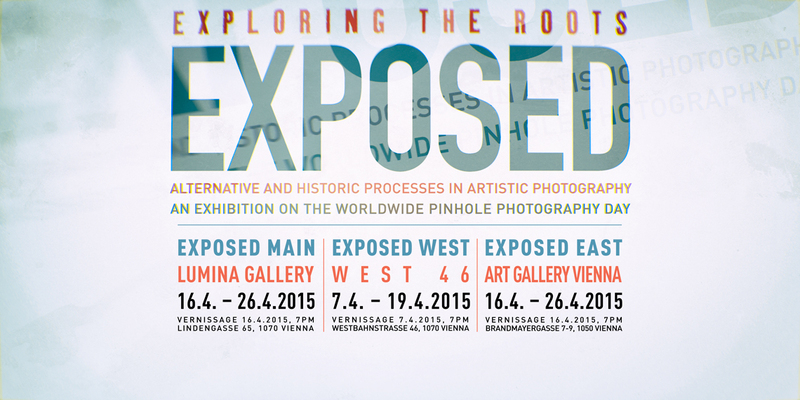 EXPOSED MAIN, the main exhibition takes place at Lumina Gallery, Austria's most established gallery for analog photographic art between the April 16 and April 26 2015 (the Worldwide Pinhole Day). EXPOSED WEST – Polaroid and 35mm photography will be featured at the remarkable West46 Gallery between April 7 and April 19 2015. EXPOSED EAST, featuring analog photography from Ukraine, Belarus, Poland and the Baltic states, takes place at the The Art Gallery Vienna between the April 16 and April 26 2015. The finissage will be a special event on April 26 featuring the World Pin Hole Day and presenting selected pinhole photography artworks. The exhibition will offer additional workshops and other events.